Want to hear something exciting? We have recently begun the exciting process of house hunting. Nothing too serious as of yet, but we know that now that we'll be getting out of the military and staying put for awhile, we don' want to waste anymore money on rent. So, we've slowly started to look at homes in our area to get a feel for what we want and don't want in a home. One thing that I keep finding myself repeating time and time again is that the carpeting would have to go. Now, don't get me wrong, I have nothing against carpet. In fact, in theory, I love it! Something soft and warm to sink your feet into after a long day or first thing in the morning... it sounds dreamy. The reality however is that I have children. Children and carpeting? Well, they are not the greatest mix. Our carpets have seen a LOT. They've seen dirt and mud from the fun of being a boy. They've seen Playdoh, crayons and paint from art projects gone awry. They've seen food and juice spills too many to count. And of course, they've seen the trials and tribulations of potty training (or diaper changes gone wrong). Yes, our carpets have gone through a lot, and as renters I've learned to just kiss our security deposits goodbye on carpets alone. As homeowners, I don't want to replace dingy carpet every few years (or live with dingy carpet). Aside from wrapping everything we owned (or the children) in plastic, there had to be a solution that gave us that plush carpet feeling we liked that could withstand everything our family would throw at it. 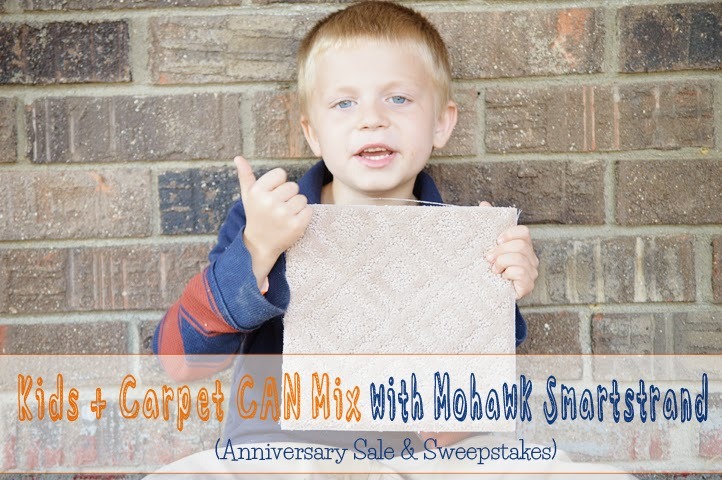 So, when I heard about Mohawk's Smartstrand Carpets, I was thrilled. What makes Mohawk Smartstrand so great? Simple- it's stain resistant and easy to clean.Unlike other stain resistant products that add protection afterwards with chemicals, the stain resistance in Mohawk Smartstrand is built into the fiber during manufacturing! This means it's there to stay...never fading away or washing off! 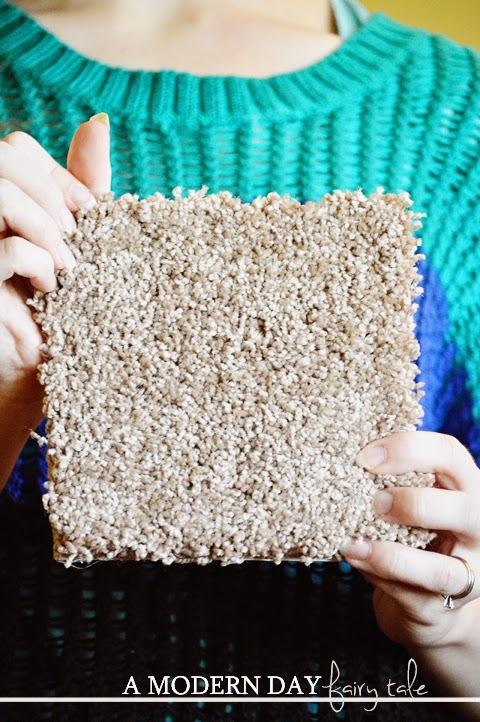 It'll last the entire life of your carpet...and that will be a long life, as it's super durable as well. Each carpet strand features a 'kinked' design that helps prevent the crushing and matting that is common with other carpets. If you're like me, you might be thinking it sounds too good to be true, and just know that your child could out mess even the most stain resistant of carpets. They're like zoo animals, aren't they? But guess what? Smartstrand was put to the test at TWO zoos- placed in rhino, elephant and camel enclosures...and they survived! Can you believe it? If they can hold up to real zoo animals, surely they can stand the test of children! But seeing is believing, so I put Mohawk Smartstrand to the test to show you just how stain resistant and durable it truly is! Take a look. What a MESS! First, I wiped up the excess, leaving behind a sticky pink stain. 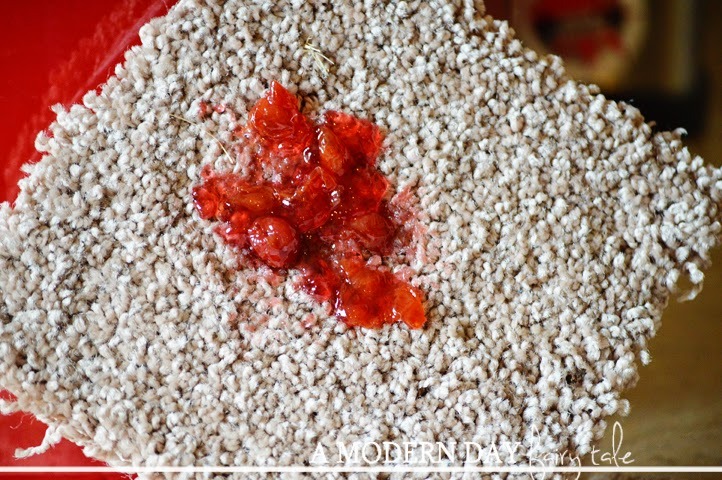 On most carpets, this is a stain that is quite difficult to clean. For this stain, I simply used soap and water. The end result, perfectly clean! 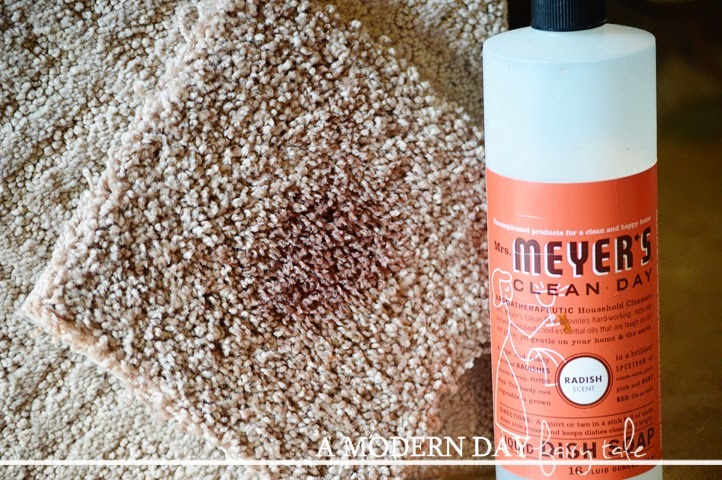 No scrubbing or harsh carpet cleaners required! I'm certainly a believer! Ready to make the switch? There's never been a better time. Shop the anniversary sale to save up to $500 on new flooring and 50% on select carpets! What a deal!! But it gets even BETTER! They're also offering a sweepstakes with 3 CASH prizes- $2500, $1000 or $500!!! Who couldn't use a little extra money- especially right before the holidays? Winners will be selected October 6, October 13 and October 20...so get your entries in NOW! 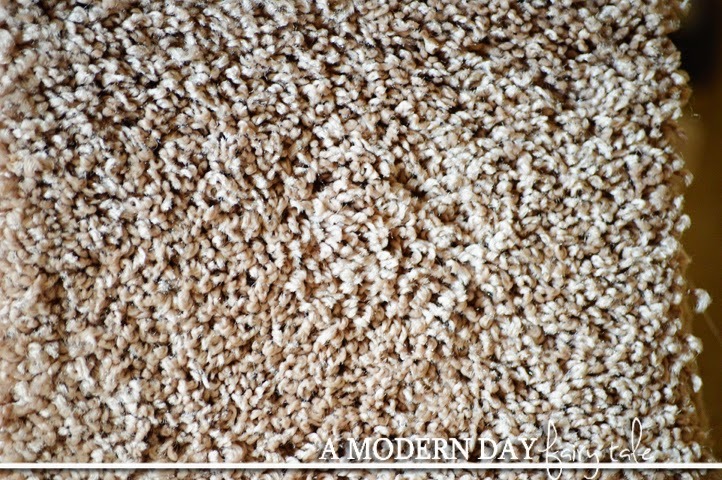 How can Mohawk Smartstrand Carpets make YOUR life a little easier? We could really use new carpeting. We had a 17 year old Jack Russell Terrier who passed away last year, and our 15 year old dog is on the verge, too. They both have had lots of accidents on our carpeting. I will keep this company in mind when we replace our carpets next year! For those of you with pets, be sure to ask about a moisture barrier pad. 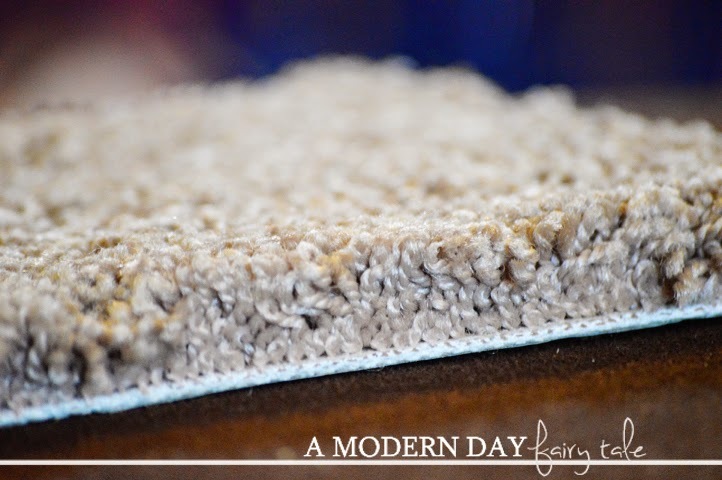 It will save your padding and improve the life of your carpet!